Effect of select kinase inhibitors on DF508-CFTR maturation analyzed by immunoblotting. 293MSR-GT cells stably expressing DF508-CFTR were treated with 15 uM kinase inhibitors or 0.3% DMSO (vehicle control), as indicated, grown at 37°C for 48 h, and the appearance of the mature protein, band C, monitored by immunoblotting with anti-CFTR antibodies. Band B represents the immature protein. 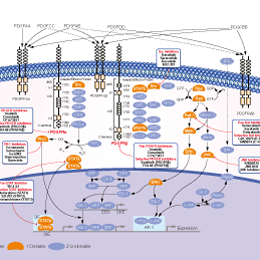 DMSO represents vehicle- alone control, 27°C represents temperature rescue of F508-CFTR at 27°C, 37°C represents untreated DF508-CFTR control, and WT represents WT-CFTR. Top panels depict the anti-CFTR immunoblot and bottom panels depict actin (loading) control. ** represents cellular toxicity. Pharmacological inhibition of PDGFR-β by cp673451 significantly attenuated the mRNA expression of BCL2A1 (E) and SERPINE (F) in ASCs. Trapidil is a PDGF antagonist that can inhibit the proliferation of the PDGF-producing glioma cells.